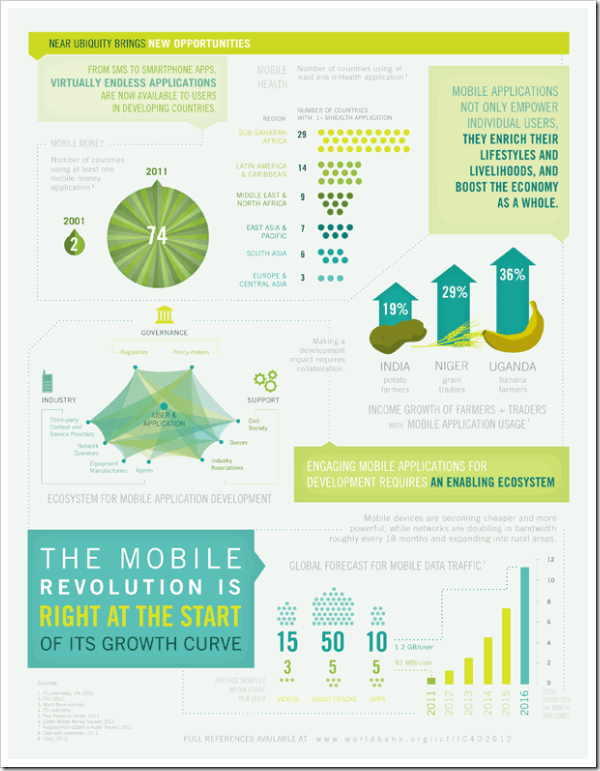 World Bank recently published a report titled Information and Communications for Development 2012: Maximizing Mobile which looks at how mobile phones and apps are changing the lives of people across the world and in India. In this post, we discuss the report’s insights that trickle down to grass-root levels in two core sectors – Agriculture and Healthcare, particularly in India. The agriculture sector employs more than 40% of total labour force in countries which have a per capita income of more than $400 and less than $1,800. India falls within that strata and it is estimated that agriculture directly / indirectly employs about 50% of the total workforce. In India and other developing countries, a majority of the population within this stratum still use a basic no-frills mobile phone. As a result, it emerges that most mobile services provided to the agricultural sector are via SMS. Their impact is felt in several key areas including commodity pricing, weather information, crop disease updates, better connectivity to the markets and access to mobile financial platforms. In particular, the World Bank report talks about ITC’s initiative E-Choupal kiosks which allow farmers access to latest prices, weather updates, farming techniques and crop insurance. Since its inception in 2000, it has been reported that this initiative now reaches out to more than 40 lakh farmers spread across hundreds of villages in 10 states. Topping E-Choupal’s success is news agency Thompson Reuter’s 2007 initiative, Reuters Market Light (RML). It is a mobile based agricultural information services platform which sends SMSes to farmers who chose to subscribe to its services via a toll free number. Farmers get SMS updates not only regarding market conditions, but also vital information regarding crops and everything related – Right from pre-sowing to post-harvest. Updates are delivered in 8 local languages and users have reported a 5 – 10% increase in income levels after using this service. Since its inception in 2007 in the state of Maharashtra, RML has directly / indirectly reached out to more than 50 lakh farmers in 13 states. In the healthcare sector, mobile technology has done much more than just allowing better connectivity between patients and doctors. The report terms the use of mobile technology to ‘address health care challenges such as access, quality, affordability, matching of resources, and behavioural norms [through] the exchange of information’, as mHealth. In developing countries like India, mHealth encompasses various improvements in the field of healthcare including real time location gathering, better logistics, extending reach of healthcare to rural and remote areas delivery of health information, crisis mapping, increased awareness, etc. For instance, mDhil is an online mobile information platform launched in 2009 and has since then, attracted a fair share of paying customers. People can subscribe to mDhil’s medical information service for 1 rupee a day and can access the platform’s services via mobile web, SMS and digital content. Translating to about Rs. 30 per month, the World Bank reports mentions that costing is in line with the purchasing power of young Indians in the age group of 18 to 25. The example of Health Management and Research Institute (HMRI) has also been used to highlight use of mobile technology in healthcare systems. The Institute, a partnership established in 2008 between the state of Andhra Pradesh and a Satyam Foundation, sends mobile medical units (MU) to areas that don’t have immediate access to a public health care service provider. These MUs allow a 25% increase in the coverage of medical services and cost a tenth of traditional services provided by the government at fixed health care facilities. Additionally, more than 3 lakh patients from remote areas have been treated over the phone. The Information and Communications for Development 2012 report looks at use of mobile services in agriculture, healthcare, entrepreneurship, governance and financial services. We chose to discuss agriculture and healthcare for two reasons – Agriculture in India employs more than half of the workforce and has the broadest footprint in the Indian economy; and Healthcare because it is a sector which affects the entire billion plus Indian population without exceptions. On Trak.in we have talked about how mobile internet users will outnumber their PC counterparts and how millions of new mobile services subscribers are being added every month. With a rapidly growing mobile network, examples of E-Choupal, RML, mDhil and HMRI seem like the beginning of a transformation in terms of access and availability of core services to the crorepatis, middle class, poor, industrialists, executives and farmers alike.